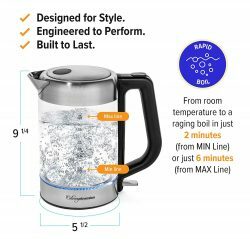 💧 FAST BOILING, QUIET, & EASY TO CLEAN – Our large 1.8l clear glass kettle brings water to a raging boil in just 2 minutes (from the min fill line) or just 6 minutes (from the max fill line). 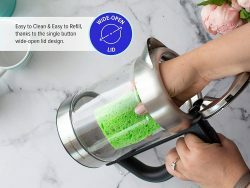 And with an extra-large 4-inch wide lid that opens almost a full 90 degrees, even the largest hand can easily fit down inside the kettle for easy cleaning. 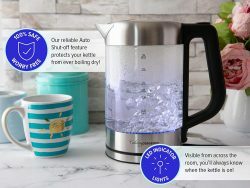 💧 WORRY FREE SAFETY FEATURES: AUTO SHUTOFF, DRY BOIL PROTECTION, & LED INDICATOR LIGHTS – Our kettle features the latest conveniences in safety technology, so you never have to worry about getting distracted or forgetting to turn off the kettle. 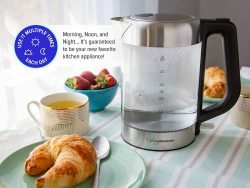 As soon as the water is done heating, the kettle automatically shuts itself off. And with one quick glance from across the room, the beautiful blue LED indicator lights will tell you whether the kettle is on or off. 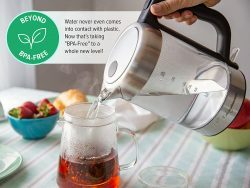 💧 WATER NEVER COMES IN CONTACT WITH PLASTIC – We’re taking “BPA-Free” to a whole new level. 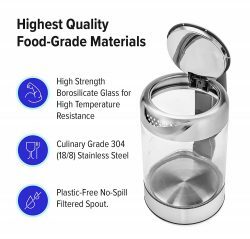 Even better, the water NEVER comes into contact with any plastic, so you don’t have to worry about toxins, flavor contamination, bad odors, or other negative effects from plastics. 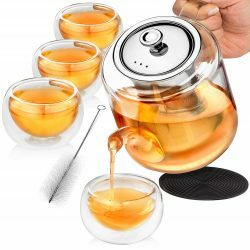 Even our lid is made of stainless steel, so you don’t have to worry about steam contamination, warping, or deformation that might occur from the plastic lid of other teapots or kettles. 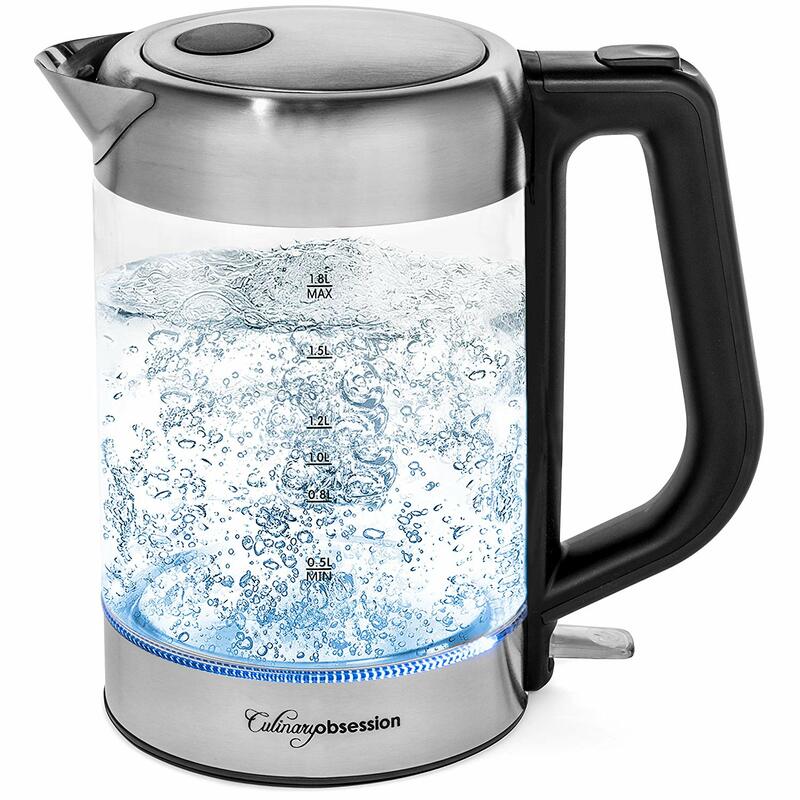 💧 LOOKS GREAT ON YOUR KITCHEN COUNTER, & DOESN’T TAKE UP MUCH SPACE – With a kettle as attractive as this one, there’s no need to store it away in the cabinet. 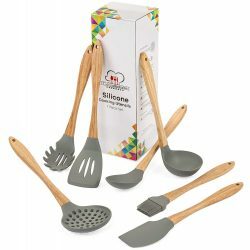 In fact, most people use it multiple times a day! 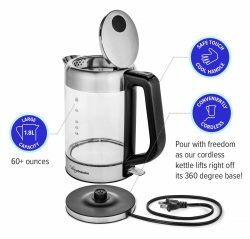 The teakettle itself is cordless, with freedom to pour your hot water anywhere, as it can be fully removed from the 360-degree base. 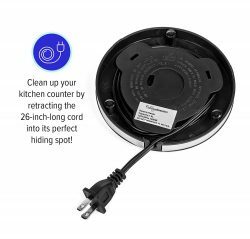 The cord length is adjustable, as the unused portion can be neatly wrapped and stored within the base. 💧 1-YEAR NO-RISK 100% MONEY BACK GUARANTEE, & WORLD CLASS CUSTOMER SERVICE – We’re so sure you’re going to love your new electric kettle that we’re willing to let you try it out now, completely risk-free. 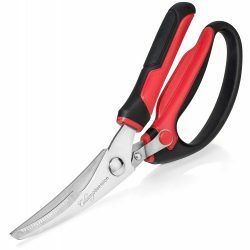 If you’re not happy with your purchase for any reason, just contact us and we’ll quickly make it right, or refund your money. That’s a promise!